I firmly believe that content is the most important part of a website, and that visitors are more likely to repeat their visits to your site for new content rather than great design or cool widgets. So when I read “CHART OF THE DAY: The Internet Is Finally, Primarily A Content Platform” I was cheered. I opened up the chart, at first glance it seemed great, but when I squinted at it a little more I wasn’t so sure. So I went through their figures of actual time spent on each of their activities and my graph looks a little different. 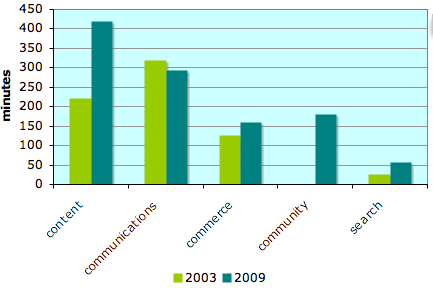 It seems to me that some of the “communications” we were doing in 2003, we are in 2009 doing under the community category. This makes sense; my sunday brunchers sort out time and place via facebook – whereas once we would have used email or in really ancient times called each other. I use flickr rather than email to share photos (although I might still email people the link) and aren’t we all tweeting now? I also took a look at the change, and here the obvious winners are community and content. Community has gone from zero to 181 minutes per month of our online time. Of the 413 extra minutes per month that we’re spending online 196 of them are in consuming content. If this change continues it won’t be long before content really is king.